Using simple props and a pair of tennis balls, Krystyn will guide participants through a 2-hour practice including relevant science, variations, modifications, and therapeutic applications. Attendees will learn to release tension throughout the body following myofascial lines and meridians, lengthening and softening fascial adhesions. This workshop blends trigger point release, fascial release, restorative elements of yoga, and simple breath-based mindfulness.Take home materials will be provided so you can continue your practice at home, anytime. Share your passion to learn or expand your knowledge of surfing during our fun and empowering September yoga + surf day camp. Our small groups usually range between 8-12 people which means you will be provided with personal support, excellent surf coaching, a safe yoga practice, and asty unch. he morning will begin with a yoga warm up on the beach, followed by a surf lesso on land and in the water. You’ll get plenty of time in the afternoon to eat lunch and rest before a fun filled day practicing your new skills in the water. All rentals and lunch provided. Join Shalom and Krystyn for a cleansing afternoon yin practice accompanied by Shalom’s wonderful crystal bowls. As the sun comes out, we all start hustling hard to fill our appetite for the growth and wonder around us. Stay present and open so that you might feel all the growth and wonder available inside. Krystyn’s 90 minute yin practice will be accompanied by Shalom and followed by a 30 minute savasana and crystal bowl sound bath. I love the Yoga Medicine orthopedic modules because they provide just the kind of in depth knowledge you want to know as a teacher to provide amazing classes and one-on-one sessions. This day-long program run by Comprehensive Health Education Services seeks to empower women with bleeding disorders by encouraging them to find their voice when it comes to decision making about the health of themselves and loved ones. Krystyn provides practical tools for stress-management that help women cope with the struggles of being the primary caregiver and work to prioritize their own health. During these presentations I teach, and show, participants the basic neuroscience of stress and the stress response in the body in order to provide a foundation of understanding for how accessing our own body's "relaxation response" through simple mindfulness and meditation practices. Yin, Restorative + fascia systems module. See Karma Yoga for more information on their teacher training programs. Guided 4-Day Backpacking Trip with NOMAD Adventures & WYLDER! Support my ladies over at Wylder by signing up for this trip before May 17 at their Kickstarter campaign! We're thrilled to offer to this exclusive adventure trip to 10 lucky participants. Join WYLDER founders Jainee Dial and Lindsey Elliott and yoga teacher Krystyn Strother of NOMAD Adventures, for a 4-Day backpacking trip in the The Mount Jefferson Wilderness area located in the central Cascade Range of Oregon. Enjoy delicious fireside meals, learn about wildharvesting and local flora and fauna, and practice daily yoga and meditation. This small co-ed group trip will allow you to unplug and re-connect to your mind, body, and heart. Meet new friends, explore beautiful scenery, and camp under the stars. *No previous backpacking experience necessary. Many weeks prior to departure, we'll provide you with a detailed packing list, an optional gear fitting at REI with Krystyn Strother, and a participant list so we can communicate with each other about carsharing, gear needs, and general question and concerns. All meals are provided. Airfare and transportation to and from trailhead location not provided. This is a very special collaboration between myself and my soul sisters over at www.wyldergoods.com. Not only will you get a fantastic day hiking in Forest Park, Oregon, you will also be the lucky recipient of a Wylder Trucker Hat, and sticker pack. Join yoga teacher and urban cowgirl, Krystyn Strother, co-founder of NOMAD Adventures, for a day of outdoor fun and community. Start the day with an all-levels hike in beautiful Forest Park followed by a yoga practice on the lawn of the historic Pittock Mansion. We will enjoy the spectacular views with a delicious picnic lunch. Make new friends, enjoy beautiful scenery, and stretch your body! More info at NOMAD or check out the campaign here! Field trips, workshops, trade show, party and yoga...oh and knife throwing contests!!! Come play in the woods with me on August 28th at 5pm for a fun yoga class. Click the image below to find out more! Join me for 4 days of yoga, meditation, music and adventure at Wanderlust Squaw Valley. Hikes are full but be sure to put yourself on the waitlist. You won't want to miss what I have in store for you. My favorite assist of all time is Tiffany's 200hr teacher training. I did my training with Tiffany back in 2009 and it was one of the best decisions I have ever made. Honored and filled with gratitude to be a part of this story. I am honored to be assisting Tiffany Cruikshank and Yoga Medicine's 500hr retreat this year in Napa, CA. We will be returning to Mayacamas Ranch Resort in the scenic Napa Valley to host this much anticipated advanced Yoga Medicine teacher training with an in-depth study and therapeutic focus on the Spine. Yoga Medicine's module format teacher trainings are usually a weeklong and take place at one of many gorgeous retreat sites we visit worldwide. These trainings include room and board and are a nice way to get away from your daily distractions and immerse yourself in learning & deepening your teaching. Really excited to be a part of Hanuman Festival this year in beautiful Boulder, CO! Come play with me this June. Check out their website and reserve your mat space today! Share your passion to learn or expand your knowledge of surfing during our fun and empowering September yoga + surf trip. Wake to the sound of ocean waves from the balcony of our oceanfront home. This adventure is all-inclusive with morning yoga, on-land and in-water surf instruction, all rental equipment, delicious organic meals AND more! Wind down after an invigorating day of activity with gentle yoga and take a dip in the hot tub and enjoy some local beer and wine! Wanderlust is a one-of-a-kind festival bringing together the world's leading yoga teachers, top musical acts and DJs, renowned speakers, top chefs and winemakers, and much, much more -- all in a setting of breathtaking natural beauty. We're talking about fun in the sun and dancing under the stars. Hiking on peaceful trails and gettin' your down dog on at the top of the mountain. Sipping poolside cocktails with your friends, and then enjoying a tasty farm-to-table dinner with views of the surrounding mountain peaks. Early morning meditations and all-night chakra spinning musical performances - it's an all-out ecstatic celebration in the most awe-inspiring locations in the world. Share your passion to learn or expand your knowledge of surfing during our fun and empowering July "weekender" yoga + surf trip. Wake to the sound of waves lapping at the sand from the balcony of the oceanfront Tolovana Inn. This adventure is all-inclusive with morning yoga, on-land and in-water surf instruction, all rental equipment, and delicious organic meals. Wind down after an invigorating day of activity with gentle yoga and take a dip in the hot tub and enjoy some local beer and wine! click here for details + reserve your spot! 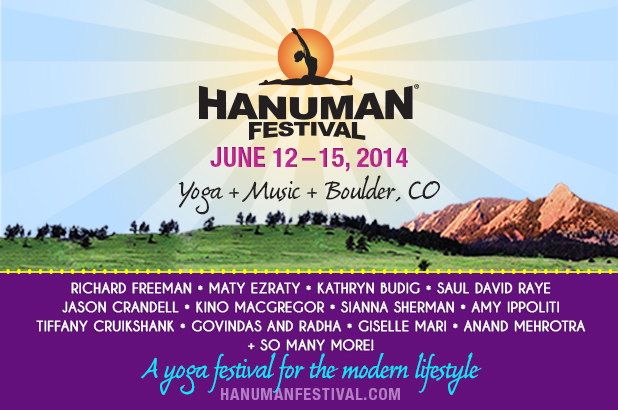 Hanuman Festival is a community-oriented yoga and music festival set at the foot of Colorado’s Rocky Mountains. Join us in Boulder, Colorado June 12 - 15, 2014 for a celebration with world-class yoga instructors, mind-blowing music, inspirational experiences and a nourishing community. Immerse yourself in body, mind and heart as you relax and rejuvenate, dance and devote, connect and expand, have fun and just be. Learn more at www.hanumanfestival.com. We'll depart from Lower Macleay Park at 9:30am sharp. Following an assortment of trails through Forest Park we will wind our way up to historic Pittock Mansion where we will enjoy yoga on the lawn, healthy snacks, and raffle off 1 FREE ticket to Wanderlust Festival Whistler. Healthy snacks provided. Please bring water, yoga mat, and appropriate clothing. Chaturanga Dandasana (the yoga push up) is a complex and often under nurtured part of our practice. Generally we practice it as a way to get from one place to the next. Without proper awareness and alignment, this pose can lead to shoulder injuries that will put an abrupt end to your practice. This 2 hour workshop will begin with a Vinyasa flow class followed by a discussion on the anatomy, alignment, corrections, and modifications of Chaturanga Dandasana. We will explore different ways to build strength to safely transition into and out of this pose as well as modifications for beginners and variations for the more advanced practitioner. Learn to develop a safe practice and confidence in Chaturanga Dandasana!